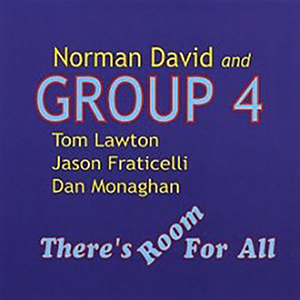 Group 4 was a band concocted by composer, saxophonist, and educator Norman David. The group had a residency at St Jacks in Philadelphia that lasted for between ‘99 and 2002. It was there that we were exploring the boundaries of jazz, free swing, and improvisation. Norman David had a book of about 200 compositions, and before the gig he would call out the tunes by number… “we’re gonna play 82, 54, 127, 3…” and so on. After a couple years playing at St Jacks, Norman brought us to Tedesco Studios in Paramus, NJ, and it was there that ‘There’s Room for All’ was recorded.